Gorgeous Views! Great Location! Convenient! 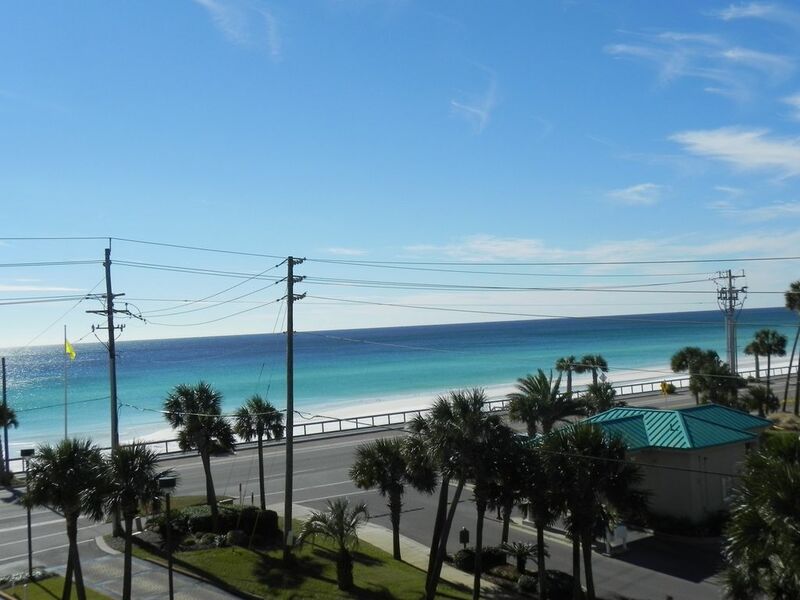 Spacious and beautifully decorated 2 bedroom, 2 bath condominium with a fantastic western view of the emerald green waters of Destin. This unit features a unique split bedroom floorplan with 1,151 square feet, 9 foot ceilings, floor to ceiling glass doors/windows in each room, and a spacious 28-foot balcony which is accessible and provides an excellent gulf view from the living room and each bedroom. Our unit is fully furnished with everything you need except your beach towels. Sleeping accommodations include a king size bed in the master bedroom, queen size bed and chair that converts to twin size bed in the second bedroom, and a new queen size sleeper sofa in the living room. The second bedroom and bath area has a privacy door separating from the rest of the unit. The master suite includes a lighted walk-in closet, dressing area, large bath with tile shower, television with DVD/cable, sitting area, and a wonderful view of the ocean. The second bedroom area includes a large closet, bath with tub/shower combination, television with DVD/VCR and cable, and plenty of floorspace for children's games. The living room is equipped with a new queen-size sleeper sofa, two leather recliners, television with DVD and cable, and excellent western view of the ocean. We have many books, board games, and movies in the unit for your entertainment. Adjacent to the living room area is the dining room area with seating for 4-6, in addition to the breakfast area seating for 4. Wireless internet service available throughout the building. This is a non-smoking unit. SORRY, no pets allowed. Surfside policy prohibits rentals to anyone under the age of 25. Rentals follow a Saturday to Saturday schedule or the minimum number of days in a Saturday to Saturday schedule. Beach chair and umbrella (2 chairs and umbrella) included in package (seasonal). Royal Palm in house restaurant and beach bar open year round; poolside food and beverage center seasonal. Several restaurants located nearby - within walking distance. We purchased our condo at Surfside in 2001 after vacationing in the Destin area for over 15 years. We loved the beach, views, deep sea fishing, restaurants, golf, and so much more and the area was our number 1 spot to go to when planning family time at the beach. Our son made his first trip at 6 months old and took his first steps on a trip to the beach about 6 months later, while there for his first birthday - we have so many wonderful memories made in Destin/Miramar Beach. Surfside was one of the first condos we stayed in while on a fishing trip many years ago. The building design, including the interior hallways, split bedroom floor plans, in-house amenities, covered parking, and easy access to the beach were attractions to us when we were searching for our home away from home! Surfside beach pavilion located beachfront and connected to pool deck area via skybridge. Board games for family fun! This property was a great location. The was close to several restaurants, the beach, and the outlets. This property was also a very comfortable stay. The only downfall was the elevator. The elevator was extremely slow, but we found taking the stair was a lot quicker. I would recommend the property to anyone. The condo was awesome! We had a wonderful week in Destin and the unit was perfect. Jerry and Donna was great to work with as well. I would definitely go back here and stay in this unit. Taking in the gorgeous view from this comfortable condo was enjoyable! It was easy to unwind and RELAX here. This unit is decorated with nice finishes and is stocked well with kitchen utensils (pots, pans, baking dishes, etc.) for those that prefer to prepare most of their own meals like us. The owners are professional, easy to work with and kind. Having the beach steps away, two very warm hot tubs, and a heated pool was amazing. Covered garage parking, resort restaurant, and beachside bar provided nice additional amenities. On-site staff were pleasant and welcoming. Best vacation for Talley Family!! This is a perfect 2BR/2BA condo! We loved the setup and location. The owners take pride in this unit, and they are VERY responsive to any concerns you might have. The balcony (3 doors in/out of living space) faces SW, so in the morning you have a perfect shaded and cool place to wake up with coffee and breakfast. The pool and hot tubs are close to the tiki hut and the restaurant (which is absolutely fantastic...best sushi EVER). The walk to the beach is minimal, as you can either cross the road or the bridge (from the pool). This condo allows you the freedom to use either set of stairs, if you choose to bypass the elevators. We will contact the owners of this unit if we return to Destin!! Thank you for the beautiful setup and easy communications!! Inhouse restaurant and poolside food and beverage center. Three to four additional eating establishments within walking distance. Salon and spa located on 1st floor. Volleyball and Tennis Courts. Location is 1 mile from the large Silver Sands Designer Outlet Mall and next door to Seascape Golf Course. Several excellent Golf Courses, Water and Amusement Parks, located close by. Also, many wonderful Restaurants. Grocery stores nearby (Winn Dixie - 1 mile; Publix 3 miles ; WalMart - 3 miles). Rental week is Saturday to Saturday; for periods of less than 1 week, dates must fall between Saturdays with no overlapping of weeks. Rates subject to change until confirmed.